Field studies have shown for the first time that several common species of seaweeds in both the Pacific and Caribbean Oceans can kill corals upon contact using chemical means. A study documenting the chemical effects of seaweeds on corals was published May 10, 2010, in the early edition of the journal Proceedings of the National Academy of Sciences (PNAS). The research was supported by the National Institutes of Health, the National Science Foundation, and the Teasely Endowments at the Georgia Institute of Technology. "Between 40 and 70 percent of the seaweeds we studied killed corals," said Mark Hay, a professor in the School of Biology at Georgia Tech. "We don't know how significant this is compared to other problems affecting coral, but we know this is a growing problem. For reefs that have been battered by human use or overfishing, the presence of seaweeds may prevent natural recovery from happening at all." 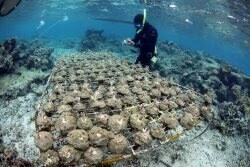 The researchers revisited the coral two days, 10 days and 20 days later. In as little as two days, corals in contact with some seaweed species bleached and died in areas of direct contact. In other cases, the effects took a full 20 days to appear -- or for some seaweed species, no damaging effects were noted during the 20-day period. Ultimately, as much as 70 percent of the seaweed species studied turned out to have harmful effects -- but only when they were in direct contact with the coral. The researchers studied coral of different species in the Pacific and Caribbean, matching them up against different species of seaweed common to their geographic areas. The coral species chosen – Porites porites in Panama and Porites cylindrica in Fiji -- are among the hardiest of coral, suggesting that other species may be even more dramatically affected by the seaweed compounds. In the Caribbean, five of the seven seaweeds studied caused bleaching of the coral, while in the Pacific, three of eight species studied caused the effect. The harmful chemicals affect only coral in direct contact with the seaweed, suggesting the compounds are not soluble in water, Hay noted. The effects -- which were measured through photographic image analysis and Pulse-Amplitude-Modulated fluorometry -- also varied considerably, with certain seaweeds showing stronger impacts than others. "Removing the herbivorous fishes really sets up a cascade of effects," said Hay, who holds the Harry and Linda Teasely Chair in the Georgia Tech School of Biology. "The more you fish, the more seaweeds there are. The more seaweeds there are, the more damage is done to the coral. The less coral there is, the fewer fish will be recruited to an area. If there are fewer fish, the seaweeds outgrow the coral. It's a downward death spiral that may be difficult to recover from." In earlier research, Hay and other researchers demonstrated that keeping fish away from coral reefs fuels the growth of seaweeds, and that certain fish are responsible for eating specific seaweed species. That information could help guide fisheries management by encouraging protection of fish that control the most harmful seaweeds. "The most damaging seaweed in our study is eaten voraciously by one species of fish, and no other species will touch it," Hay said. "Now that we know that seaweeds can kill coral through these chemical means, it is even more important to understand which herbivores control which seaweeds so we can consider additional protections for these critical fish species, even outside of normal marine protected areas."